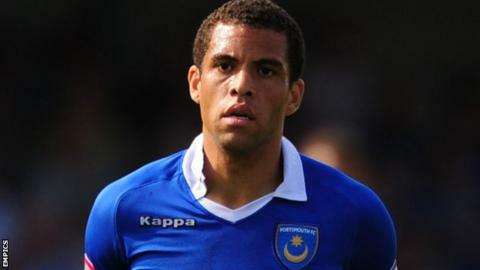 Portsmouth midfielder Darel Russell has confirmed he has left the club a day before his contract was due to expire. Pompey, who are in administration, lost six players earlier this month and most of the squad are on short-term deals. On his personal Twitter account he said: "I hope this great club, fans, staff and players have this situation which is out of their hands resolved. "For those who showed me support thank you. I enjoyed playing for Portsmouth and wish things were different." The 32-year-old former Norwich and Stoke midfielder arrived in the summer after his release by Preston and had made 18 appearances this season. Administrators PKF have already said they are looking to offload some of the senior players to reduce the wage bill. The Fratton Park side have been in administration since February 2012 and look set for a second successive relegation, as they sit in the League One drop zone and still face a 10-point deduction. "I think a lot of fans and some of the players and staff have been let down by the way the situation has been perhaps handled and it's caused a few issues," Russell told BBC Radio Solent after the 3-1 loss to Hartlepool. "We're at a stage now where we are scrambling to put a good team out. "It's a difficult one for me because I want to win every week and if you're not doing that then you need to be doing something that really drives you forward as a player, and I want to be progressing. "At no point in my time do I want to be going backwards as a player and if I start to go backwards and in the situation that I am, I think it's time you perhaps stop or you change what you're doing."